K. Kertess, The Pacesetter Corporation's Collection of Contemporary Art, Omaha, 1983-1986, vol. 2, n.p. (illustrated in color). J. Farber, Phillip Schrager Collection of Contemporary Art, Omaha, 2008, n.p. (brochure; illustrated in color). C. Cook, "Schrager's office reflects his 'passion' for art," Midlands Business Journal, April 1-7 1988, p. 17 (illustrated). Swarthmore Collage, Wilcox Gallery, Brice Marden, December 1963-January 1964. New York, Matthew Marks Gallery, Brice Marden: 1961-1964, October 2009-January 2010. One of Brice Marden's earliest mature paintings, Dylan Study II is of seminal significance to the development of one of America's most celebrated living painters. Painted in 1963, the year that Marden graduated from Yale University of Fine Arts and moved to New York City, it was exhibited that winter at his very first solo exhibition at the Wilcox Gallery, Swarthmore College in Pennsylvania. Marden remembers this period as a "great time," thriving in the caring, optimistic and liberal atmosphere of the burgeoning New York folk scene. 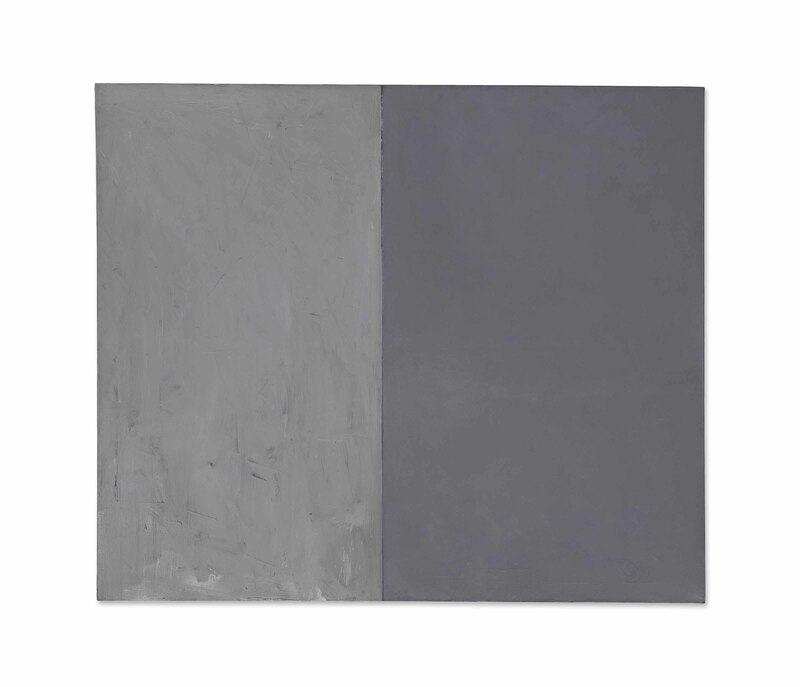 Keen to help one particularly gifted musician, Marden dedicated this early grey abstract to his friend Bob Dylan. In naming one of his most major recent paintings Dylan Study II, Marden hoped that it would raise awareness of Dylan's prodigious talent. By the time it was exhibited at the end of the year, however, the young Dylan had released his second album, Freewheelin' Bob Dylan, and was on his way to superstardom. The album reached number 22 in the US charts, and number 1 in the UK. Marden recalls this period and his friendship with Dylan with great fondness, saying: "I was hanging out with all these folk singers, and it was a great time. I met Bob Dylan through a good friend and he was really fantastic, he was a fantastic guy, and that was really something to hang out with him, he'd always been kind of a hero for me" (B. Marden, quoted in "Oral history interview with Brice Marden 1972 Oct. 3," Smithsonian Archives of American Art). Marden's distinguished career has been premised on an assertive and intelligent commitment to abstract painting, and an indefatigable belief in the subjective resonance of color, light and surface. In 1966 Marden developed a technique that emphasized this sensitivity, dipping an oil-covered brush into a mixture of melted beeswax and turpentine, and applying it generously to the canvas, smoothing it later with a spatula to eliminate the brushstrokes while retaining the sense of the handmade. This singular method created paintings that achieved the textural delicacy and intensity of color that Marden had been searching for in his earlier work, a technique that was to establish his career and remain central to his practice until the 1980s. It is testament to the importance of Dylan Study II in the strengthening of Marden's artistic voice that one of the first paintings to use this method, The Dylan Painting, 1966/1986, revisits the cool, grey stillness achieved in Dylan Study II. A masterly demonstration of the emotive potency of simplified form and carefully calibrated color, The Dylan Painting, now in the collection of the San Francisco Museum of Modern Art, is recognised as a truly seminal work; exhibited at Marden's first New York solo show Bykart Gallery in 1966 and selected as a highlight work in his retrospective exhibition at the Museum of Modern Art, New York in 2006. Dating from a time of discovery and consolidation when central characteristics of the later works were first allowed to emerge, Dylan Study II was in many ways a precursor to these later works. Presaging the beeswax technique, the surface of Dylan Study II is highly textured, showing energetic, layered paint strokes, first applied with a brush, worked with a palette knife, and then varnished liberally, leaving a lush, oily sheen. The painting's spare composition of two asymmetrically aligned rectangles is a characteristically restrained result of a process of formal reduction that Marden had started at Yale, where he was inspired by the monochrome expressionism of Willem de Kooning and Franz Kline. He found that this pure abstraction achieved satisfying concentration and intensity, while retaining an emotive sensibility. "The paintings are made in a highly subjective state within Spartan limitations." Marden has said. "Within these strict confines, confines which I have painted myself into and intend to explore with no regrets, I try to give the viewer something to which he will react subjectively. I believe these are highly emotional paintings not to be admired for any technical or intellectual reason but to be felt" (B. Marden, quoted in Brice Marden. Paintings, Drawings and Prints 1975-1980, London, 1981, p. 51). The subtle balance of cool and warm grey in Dylan Study II is demonstrative of Marden's profound sensitivity to color. They are the complex greys of an Ingres or a Zurbarn; not simple combinations of black and white, but carefully tuned unions of umber, pinks and blues. Ever changing in the light, their ambiguity reflects the romantic undercurrent of Marden's work, which takes color as its starting inspiration: "I begin work with some vague color idea; a memory of a space, a color presence, a color I think I have seen" (B. Marden, quoted in D. Anfam, "Brice Marden", Artforum, January 2007 pp. 242-243). Citing Mark Rothko as a key influence, the drifting, ineffable shapes found in Marden's work elude a direct interpretation, and encourage a renewed sensitivity to the sensation of looking. Painting, Marden has said, is about "knowing yourself by forgetting about yourself" (B. Marden, quoted in P. Schejeldahl, "True Colours: A Brice Marden retrospective" in The New York Times, November 6 2006). The quietly confident abstracts from the period that Dylan Study II was painted seem infused with the positive ideology of the avant-garde creative community that Marden found himself at the heart of in the 1960s. Living in lower Manhattan, and married to Joan Baez's younger sister, Marden became friendly with many of the singers of the time, many of whom were active participants in the protest movements of the period. Collectively evoking the extraordinary creative energy of New York in those years, Marden continued to name some of his large, monochromatic abstracts after his singer friends in homage to their influence and to their genius. One monochrome work is called Nico, 1966; while the paintings For Otis, 1967/68, For Pearl, 1970, and Star (for Patti Smith), 1972/74, are dedicated to Otis Reading, Janis Joplin and Patti Smith, painted in a desire to evoke their passionate essence. Famously quoted as saying "the rectangle, the plane, the structure, the picture are but sounding boards for a spirit" (B. Marden, quoted in D. Anfam, "Brice Marden", Artforum, January 2007 pp. 242-243), Marden breathed warmth and human sensibility into a Minimalist aesthetic. Like the creative individuals that these paintings pay tribute to, underneath their ineffably cool, beguiling surfaces, lie singular, intensely romantic spirits.